From one of America’s most accomplished and acclaimed fiction writers, a chilling, spectacularly riveting novel based on a real life multiple murder by a con man who preyed on widows—a story that has haunted Jayne Anne Phillips for more than four decades. In Chicago in 1931, Asta Eicher, mother of three, is lonely and despairing, pressed for money after the sudden death of her husband. She begins to receive seductive letters from a chivalrous, elegant man named Harry Powers, who promises to cherish and protect her, ultimately to marry her and to care for her and her children. Weeks later, all four Eichers are dead. Emily Thornhill, one of the few women journalists in the Chicago press, becomes deeply invested in understanding what happened to this beautiful family, particularly to the youngest child, Annabel, an enchanting girl with a precocious imagination and sense of magic. Bold and intrepid, Emily allies herself with a banker who is wracked by guilt for not saving Asta. Emily goes to West Virginia to cover the murder trial and to investigate the story herself, accompanied by a charming and unconventional photographer who is equally drawn to the case. Driven by secrets of their own, the heroic characters in this magnificent tale will stop at nothing to ensure that Powers is convicted. 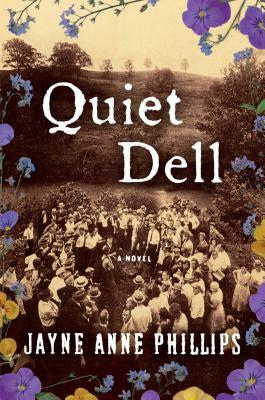 Mesmerizing and deeply moving, Quiet Dell is a tragedy, a love story, and a tour de force of obsession and imagination from one of America’s most celebrated writers. Jayne Anne Phillips is the author of Lark and Termite, Motherkind, Shelter, and Machine Dreams, and the widely anthologized collections of stories, Fast Lanes and Black Tickets. A National Book Award and National Book Critic’s Circle Award finalist, Phillips is the recipient of a Guggenheim Fellowship, two National Endowment for the Arts Fellowships, a Bunting Fellowship, the Sue Kaufman Prize, and an Academy Award in Literature from the American Academy and Institute of Arts and Letters. She is Distinguished Professor of English and Director of the MFA Program at Rutgers-Newark, the State University of New Jersey, where she established The Writers At Newark Reading Series. Information, essays and text source photographs on her fiction can be viewed at JayneAnnePhillips.com.